Life in Kerala is punctuated by the annual festivals dedicated to village deities. These post-harvest festivals are an occasion to break out of the monotony of daily routine. The size and importance of this festival may vary from small gathering to mega spectacle like Thrissur pooram. There are other Pooram festivals in and around the central Kerala which may stand better than Thrissur pooram in some respect. But the beauty of Thrissur pooram is in every respect Thrissur pooram stands better than the best. The Thrissur Pooram is considered to be the Mother of all Poorams, a culture highlight that towers above all other festivals .Thrissur pooram is a festival unique in its pageantry, magnitude and participation. It is not a mere temple festival in its strict sense but at the same time it is the festival of festivals of Kerala. The Thrissur Pooram, celebrated in the Malayalam month Of Medom (April-May) is a grand assembly of Gods and Goddesses in and around Thrissur. These Gods and Goddesses make their visit to the Vadakumnathan Temple premises on caparisoned elephants accompanied by grand ensembles of Chenda melam and pancha vadyam. The Ten participants of the Pooram are the Thiruvambady Bhagavathi and Paramekkavu Bhagavathi, Nethilakkavu Bhagavathi, Karamukku Bhagavathi, Ayyanthole Bhagavathi, Laloor Bhagavathi, Choorakkattukavu Bhagavathi, Chembukkavu Bhagavathi, Panamukkumpally Sastha, Kanimangalam Sastha. The processions and rituals of each of these deities follow a very strict itinerary, scheduled in such a way that the tempo of the Pooram celebrations - 36 hrs non-stop - is maintained without any loss of energy. Very many stories are told and retold about the origin of Thrissur pooram. Thrissur pooram is 200 plus years young and before that the "Arattupuzha pooram" conducted at Arattupuzha, some 16 km away from Vadakumnathan was the biggest temple festival of Kerala. All the temples participating Thrissur pooram and Kuttanellore pooram was the regular participant of "Arattupuzha pooram" .Once these temples were delayed to attend the festival due to heavy rain or so and then chief of Peruvanam Gramam denied the entry. As an act of reprisal Thrissur Naduvazhi the chief of Vadakunnathan, known as Yogadiripad and Kuttanellur Naduvazhi started the pooram in Thrissur. Later due to some reasons the Kuttanellur Naduvazhi disassociated the celebration at Thrissur. Since the withdrawal of Kuttanellur Naduvazhi the glamour of the pooram was lost and the two 'Naduvazhies' began to treat each other as enemies. It was in this juncture the former ruler of Cochin, His Highness Ramavarma Raja, popularly known as Sakthan Thampuran (1751-1805 AD) became the Maharaja of Kochi. Sakthan Thampuran unified the 10 temples situated around Vadakumnathan temple and took steps to celebrate Thrissur Pooram as a mass festival. Sakthan Thampuran classified the participants in to two groups the western and the Eastern The western group consist of Thiruvambady, Kanimangalam, Laloor, Ayyanthole, and Nethilakkavu temples. Paramekkavu, Karamukku, Chembukavu. Choorakottukavu and Panamukkamppilly comes under eastern group. The Maharaja re - organized the annual festival in its present form in front of Vadakumnathan. Sakthan Thampuran also directed the main temples at Thrissur, Paramekkavu and Thiruvambady to extent all support and help to other poorams which are coming from 2 to 10 KM. away from Vadakumnathan temple. Recently the Kanimangalam changed to eastern side. The event management of the whole pooram was chalked out by His Highness Sakthan Thamburan and followed iota till now. There is an epilogue to the "Arattupuzha" pooram participation . While the Arattupuzha pooram has a history of more than 1000 years, Paramekkavu temple is 600 years old and Thiruvambady is still younger. Further Thiruvambady bagavathy, Paramekkavu baghavathy and Neithalkavu bagavathi are "Bhadra kali" deities.. Only Sastha's or Durga's are the participant of Arattupuzha pooram. The other seven participients of Thrissur pooram which's ancientry dates back to early 8century A.D and are Sastha or durgha cult, may be regulars to Arattupuzha. 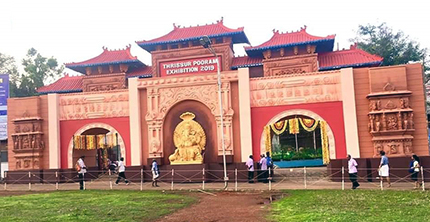 The city is in jubilant mood since the opening of the Thrissur pooram Exhibition. The exhibition is an excellent platform to educate, promote, advertise and sell the products. 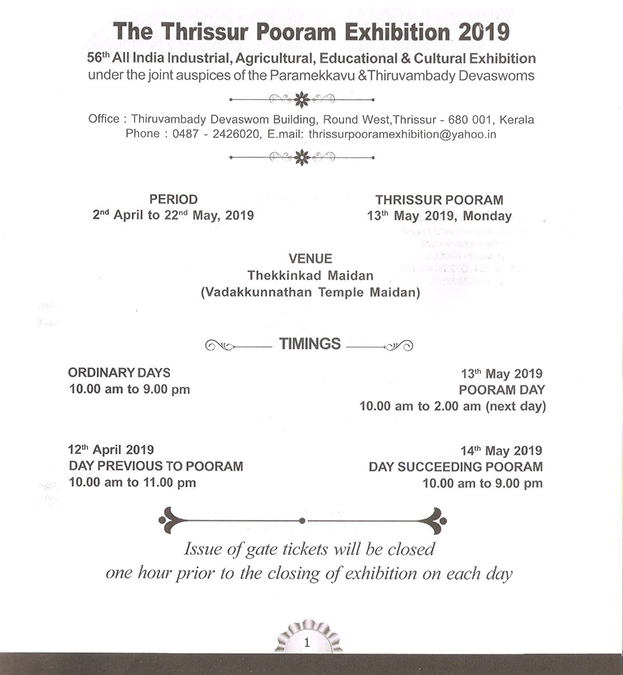 Informative stalls, pavilions, play stations and with active participation of both central and state governments the Thrissur pooram exhibition is conducted without interruption since 1964. The tempo starts with the flag hosting and in full spirit from day before yesterday of the Pooram day. It is in this day the sample fireworks are displayed in the vadakunnathan maidan. This is the curtain raiser to the real display of pyrotechnics of the pooram. Started as a sample testing of the fire works for alternation / modification, it has turned to an event attracting very huge crowd. Both Paramekkavu & Thiruvambady started to arrange their respective Parasols, Ornaments etc neatly in their stores which started to attract people in a large scale. Now it turned another curtain raiser to Thrissur Pooram. This "chamayakazcha"(Viewing the display of decorations & ornaments) is another amazing experience of pooram which is open for 36 hours. There is another curtain raiser to Thrissur pooram. The one among the Constituent PooramsNeithilkavu Bhagavathy is privileged to announce that the Thrissur Pooram is ON. The previous day of the pooram Devi enters the vadakkumnathan temple with all accompaniments, pays her salutation to Vadakkumnathan and open the southern gopuram which was closed on the previous pooram day after the "kudamattom". Devi moves to western gopuram throughmaidan to sreemoolasthanam. Devi is received by the Cochin devasom board representative and escorted to nilappaduthara. Here the pooram is announced by play of conch thrice. The participant poorams are divided into two parts namely "Paramekkavu side" and "Thiruvambady side". The Paramekkavu side consists of besides "Paramekkavu Bagavathy". 1) Pookattikkara-Karamukku Baghavathy, 2) Choorakattukara Baghavathy, 3)Chempukkavu Baghavathy, 4) Panemukkumpilly Sastha. Besides Thiruvambady Baghavathy, the Thiruvambady side is having 1) Ayyanthole Baghavathy 2) Nethilakkavu Baghavathy 3) Laoor bagavathy 4) Kanimangalam Sastha. Chembhookavu : 6.00 to 6.15 pm. The modality followed "Padhathy" and the flag hoisting is done by celebration committee. Most of the temples are having permanent flag posts but pooram flag will be hosted in a makeshift post made out of fresh Arecanut tree. The post is cut in a ritualistic style by the carpenter of the domain. (Desathe Assari). The title is hereditary and the carpenter undergoes one week vow before starting this. He does the bhoomipooja too. Interestingly this is the one and only time a non Bhramin performing a pooja inside the four walls of the temple. True to the tradition carpenter will wear the sacred tread at that time. The hoisting is done after taking the permission from the senior most member (desathe assan) of the domain. Thiruvambhadi hosts temporary flags at Naduvilal and Naickanal and Paramekkavu at manikandanal to declare the pooram is on. In line with this Karamuku pooram hoists another flag at ollurkkavu junction chiyyaram. There will be two flags in neithalkavu temple, one in front of Devi temple and other in front of anthimahakalan. For more details please see "Rituals"
The Schedule : The 36 hour long pooram follow strict time schedule and prescribed route to pay obeisance to Lord Vadakumnathan. The day starts with "Kanimangalam sastha" entering to vadakumnathan through southern gopuram and exits through western goupuram While chembookavu baghavathy, panemukkumpilly sastha and Paramekkavu bagavathy enters through eastern goupuram and leaves through southern goupuram. The poorams of Laloor, Ayyanthole, Neithalkavu, Choorakottukavu, moves tothekkinkadu maidan from Naduvilal(west) and enter vadakumnathan through western goupuram leaves through southern goupuram. Karamukku bagavathy moves through manikandanal(south) and enters through western goupuram and leaves through southern goupuram. Thiruvambady moves to maiden through Naikanal(North) and enters to Vadakumnathan through western gopuram and leaves through southern gopuram. The night route is different since except panemukkumpilly & Chembookavu no other pooram enters to Vadakumnathan. Paramekkavu,karamukku, enters through "Manikandanal". Kanimangalam, Ayyanthole, laloor, neithalkavu, chhorakottukaventers throughNaduvilal while Thiruvambady through naickanal But all poorams conclude at "Nilapaduthara" near western goupuram. The Paramekkavu & Thiruvambady stops their pooram for fire works at their pandals at manikandal and Naickanal at 2.30 am and starts at 7.30.& 8.00 am from their respective pandals and concludes at Sreemoolasthanam at 11.30 & 12noon. The pooram starts with the ceremonial entrance of "Kanimangalam Sastha" pooram through the southern goupuram at 7 am.This is followed by the arrival of Panamukkampilly Sathavu, Chembookavu Karthiayani Devi. Karamukku Karthiyani Devi, Choorakkottukavu Durga Devi, Ayyanthole Karthiayani Devi,and Naithalakavu Bhagavathi . Paramekkavu Bhagavathy and Thiruambady Bhagavathy escorted by Krishna. The pooram day: The temple opens at 04 am after the routine poojas, Arattu at 6.00 am and other rituals connected to pooram, "nadakkal para" starts. At 12.30 noon Devi comes out and the famous "purappadu" starts with 15 elephants. The melam starts with "Chempada" (longest in duration and magnificent in performance) during these Kudamattam will be performed. The pandy will start at 2.00pm and the procession moves to "Vadakumnathan" for the thrilling "elingithataramelam". At 4.30pm the melam concludes and the procession exits through southern gopuram "thripuda" melam will accompany the procession. The procession will face the southern gopuram stationing at the round. Meanwhile thripuda will conclude after kombhupattu, and kuzalpattu "Panchari" will start. At 5.00 pm Thiruvambady bhagavathi will start decenting and the "Devine Durbar" will start with kudamattam. The greatest show on earth concludes at 6.45pm and Devi returns to temple with "Nadaswaram". Night pooram stats at 10.30pm with 7elephants with "Panchavadhyam". The pooram moves through round west, round south and ends at Manikandanal pandal at 2.30am. After the fire works day pooram starts at 7.30am and moves to Sreemoolasthanam with 15 elephants. Another thrilling experience with "pandy melam" and kudamattam pooram concludes at 11.30am. After the touching farewell with Thiruvambady bhagavathi Paramekkavu Bhagavathi returns with jubilant crowd to abode. After "parayeduppu" and arattu at "pandijarchira" (western pond) Devi returns to temple and will be received with pandy melam. After kodical pooram Devi takes rest with uttrampattu. The temple opens at 3.00 am after routine poojas and "usha Seeveli" the "nadakkal para starts". At 7.30am Devi starts for pooram with Lord Krishna's "kolam" and devi's thidambhu. The ensemble moves through shoranur road naickanal, Naduvilal and old nadakavu to Brahmasom Madhom. After erakkipooja the pooram starts with 3 elephants and "Panchavadhyam". This famous "madathil varavu" will starts at 11.30pm and will play 2 thalavattom in 3 kalams which will be spread over 100 mts. The pooram will enter the western round through pazhayanadakkavu and 4 more elephants join. The sweet and splendid Panchavadhyam will conclude at Naickanal pandal at 3.00pm. The procession will move to "sree moolasthanam" with 15 elephants and "pandy melam". The melam concludes at 5.00pm and enters to Vadakumnathan temple. The famous Divine durbar will starts at 5.30pm facing the Paramekkavu bhagavathi in front of the southern gopuram... After the "kudamattam" bhagavathi moves to "Madhom" for "irakky pooja". The night pooram starts from madom at 11.30 pm with panchavadhyam and ends at naickanal pandal at 2.30am. Devi watches the fire works from 3.00 am to 6.00 am and starts the procession at 8.00 am to vadakunnathan with "pandy melam". The pooram concludes at 12noon After the fare well devi returns. In the evening devi takes holy dip at padijare chira and returns the temple at 7.pm. After "kodikuthu" the pooram concludes. The temple can be reached by road, hardly 300meters from Old gate stop, kanimangalam and through Ayyappankavu road. The kanimangalam Sastha is supposed to be the deva guru, who is allergic to sun and rain. Simple sreekovil with towering gopuram and small but beautiful pond, surrounded by kole land Sastha temple is famous for its ambience too. An equally important temple Methevar Siva temple is just 100 meters away from this temple. Consecrated by "Thachanat" Moos and on decline of this family, these temples were merged to Valiyalukkal Group devaswom managed by PanmukkathuMaliyekkal Naduvazhy. This legendary naduvazhy forcibly brought 7 gold accruements and a gold Kolam from kuttanellore pooram to please erstwhile raja of Kochi... The legend may be the part of the rivalry between Kuttanellore and Thrissur which in turn caused the decline of Thrissur pooram. Starting its journey on pooram day at 5 O'clock in the morning from the temple accompanied by Nadapandy and Nadaswaram and reaches Kulassery temple at Veliyannur. With 9 elephants, It reaches to round south from were it turns east and enter through Southern Gopuram of VadukkumnathaTemple and reaches Elinjithara. The kanimangalamsastha normally characterized as the guardian pooram is the only other pooram which is allowed to perform pandy melam at elanjithara Sree Vadakkumanathan pay great respects to Deva Guru and honour him opening Lord's Thirunanda. The pooram passes through western gopuram to Sreemoolasthanam were the Pandy melam at its brisk point performed and finally ends the day pooram. The lord takes rest at kulassery temple By evening at 7pm. with panchavadhyam and five elephants, the Pooram starts from Kulassery temple and moves to sreemoolasthanam by round west, naduvilal. 9 O'clock the pooram concludes and the lord returns to kanimangalam. The next day with parayeduppu arattu, kodical pooram and kodikuthu celebrations concludes. The temple is one among 108 Durga kshetras Vigneswara and Dharma sastha are sub deities here.The temple is about 2.5km of north west of vadakkumnathan Since the deity is allergic to sunstroke is forced to return on pooram day before the temperature rise and pleased to travel again in the wee hours according to legend. However the foremost offering is "Nai Vilakku" (Ghee is used instead of oil to lighten the lamp) in this temple substantiate the story of "Headache". The chieftains of the foremost among the 32 grammas of Kerala (to be translated as corporations) Thrissur Namoodiries and Dutches had a long legal battle about the ownership of this temple. The history long back to 280 years. Another version of the story is simple, innocent and straight forward namboodiri families were drawn to this politics between His Excellency of Kochi & the Dutches. It is believed that while digging for foundation the parts of this Kshetra was found and hence this temlple. The ooralan was Cungrathmenon family. Sri Kathiayani temple at Chembukkavu coming under the direct control of the Cochin Devaswam Board. With its proximity to the Paramekkavu and Thiruvambady temples and its rich tradition of giving spiritual solace to hundreds of its devotes, the temple plays a major role in the Thrissur Pooram .The temple had a face lift through the "naveekaranakalasa" during 2009. The day starts with arattu and other rituals. Pooram starts at 7am with Panchavadhyam and nadaswaram and three caparisoned elephants the procession moves to Pooramparambhu through palace road. Bhagavathy enters through eastern gopuram to the Vadakumnatahan and complete the Panchavadhyam near southern gopuram. With melam Bhagavathy descents through the gopuram. And the day pooram ends. Since Bhagavathy is allergic to sun stroke, Devi returns to the temple in a hurry through Naikanal. The night pooram exits through western gopuram and ends at Nilapadu thara. Next evening with arattu, kodikkal pooram and kodikutthu the celebration concludes. Ayyathole Bhagavathy another constituent of thrissur pooram pays a visit to Chembhukkavu Bhagavathy. The very next day after the kodiyettom Ayyanthole Bhagavathy pays a visit to Chembhukkavu temple and Chembhukavu Bhagavathy returns the visit. To mark the occasion a sandal wood piece is taken from chembhukavu by Ayyanthole Bhagavathy and in return a plate from ayyanthole by Chembhukavu Bhagavathy. The Panamukkumpally Dharma Sastha Temple is situated about 2 kilometers east of Sree Vadakkumnathan Temple Thrissur. The idol, which is said to be 2500 years old, symbolizes Sree Dharma Sastha mediating in Padmasanam with a pot filled with Amrit A rare posture of Lord Sastha. The sub deities of the temple are Lord Shiva, Vinayaka and Nana Durga. It is believed selfless devotion and prayer, with complete dedication to the Lord Sastha can cure even major diseases. It is also very auspicious to begin education of children in divine presence. Thekkemadom Swamiar who migrated to Thrissur constructed this temple at Kizhakkumpattukara for "SRI AYYAPPA" which they have brought along with. The decedents of Madom make customary visit to the Temple and offer Pushpanjalis to the Lord. Years later, the Prominence of the Madom faded and that administration was handed over to Bharanasamithi elected by the devotees of Kizakkumpattukara This temple stopped to participate in Thrissur pooram in early 1900 A.D due to some silly excuses. With right support and guidance from thrissur pooram ekopana samithy, panamukkumppilly pooram was rejuvenated during 2002 and raised to full vigour by 2006. The Panamukkumpally pooram will start at 7am from the temple with 3 decorated elephants accompanied by Panchavadhyam and Nadaswaram via East Fort Junction, college road and turns towards north and enter into Sri Vadakummnathan Temple via Eastern Gopuram. The panchavadhdyam concludes near southern gopuram. The same Process would repeat and the pooram ends in front of eastern gopuram in the night. The next day with kodical pooram the celebration concludes. The famous Pookkattikara-Karamukku Temple is situated 5 kilometer from Vadakkumnathan Temple under Thrissur corporation. Through Ernakulam route or Thrissur - Kodungallur route the temple can be reached. Pookkattikkara - Karamukku Temple is built around paddy fields accompanied by the 2 acres wide "Karamukku Pond" a reservoir which is very helpful for perennial water supply for residents of the area and for sacred bath for devotees. This temple is a multi temple viz, Pookattikkara Siva temple & Karamukku Bagavathy temple. The earlier temple was in the southern side of the "Pookattikkara" village and brought to this place. Lord Parasurama brought some Namboodiri families from north Malabar to do the "Poojas" of Sri Vadakkumanatha temple. It is believed that this family brought their family deity "Lord Siva" along with them and hence the Pookattikkara temple. 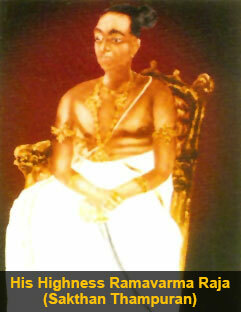 Karamukku Bagavathy is one among the 108 Durgalayas by Bargava Rama. The Karthiyani Devi along with her brother Krishna is the main deities of karamukku temple. Edampiri Ganapathy, Nandi (the holy bullock) and Siva are the deities of "Pookattikkara" Temple. When this is combined the Pookattikkara-Karamukku temple. Two prominent double Vatta SreeKovil (holy shrines), and another single Vatta Sreekovil is the the miniature of Sree vadakkumanatha temple. The three balikallus shows the importance of this temple. The temple is the holy sum of three divine powers - Saiva, Vaishnava Saktheya. It is believed that "Khara" the saint who was the chief architect of many temples was stationed here. Another story is related to Ramayana. Khara an Asura warrior specialized in bow & arrow, challenged Lakshmana, for misbehaving Khar's half sister "Soorpaneka". The battle lasted for months finally khara was defeated. kara took assylam in this large pond for days to heal and hide. Khara mukku turned Karamukku While living in exile at Maliyekkal tharavadu, Sakthan thampuran used to take bath in this pond. Thampuran had a soft corner to this temple and when he returned to power he took over this temple complex Thampuran allotted 200 acres of paddy fields to maintain the temple. On the seventh day after Tantric Poojas. Karamukku Bhagavati's "Ezhunnallippu" starts Pooram muhurtham at 5 am. Along with "Nadaswram" and Nadapandi, the Ezhunnallippu reaches Kulassery temple. 3 elephants with Pandymelam the possession reaches "Manikanatanal Pandal" at 8 O' clock. Here number of elephants increases to 9. The pandy melam witth more than 150 members moves to sreemolasthanam. This is the curtain raiser of famous "Elinjitara Melam". The Pandimelam will be over by 9.30am at "Sreemoolastanam" and the deity go inside temple to pay respects to Lord Vadakkumanathan and exit to Southern gopuram. and returns to Kulassery Temple. Night pooram. In the evening 7pm the pooram starts from kulassery temple. 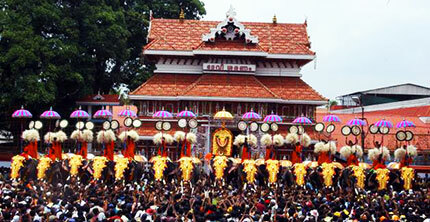 With panchavadyam by more than 60 members and 3 elephants the pooram moves to sreemoolasthanam though manikandanal. Pooram ends at 10pm and after paying a visit to "Nilapaduthara" devi returns to chiyyaram. After proper rest in the day by evening after "Aarrattu" at Karamukku pond. "Utram Vilakku" Ezhunnallippu begins with 3 elephants. 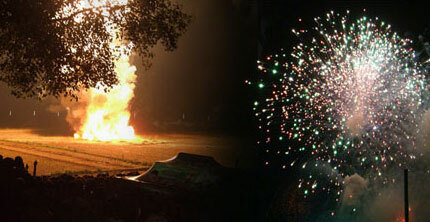 Pachari melam and fire works are the main attractions which is up to 10pm. With Tantric Pooja and Utram Pattu devi takes rest. Flag at temple and at Ollukkavu junction hoisted by devotees are driven down by the elephant with great jubilisation. Laloor Sree Karthiyayini Temple is one among 108 Durgalayas by Saint Parasurama. The idol is Chathur bahu vigraha This temple is located at Laloor, 5Kms away from Sree Vadakumnatha temple in south - west direction. Laloor Sree Karthiyayini temple is distinct in many ways. There is no sub - shrines in the temple. The size of the "Valiya Balikkallu" is nearly 8 Feet high which shows that the type of prathistha. Temple architecture is closely connected to Sree ramatemple in Vadakkumnatha complex. The priests were from the same family who were head priest of Sree Rama temple The mural paintings are in the shrines. The Kerala style of architecture, the gothic style of mural painting of the temple are without any parallel. Once the temple was owned by Mannath family. Due to various reasons the temple started to decline. After naveekaranakalasa and renovation the temple has returned to its earlier stage now Laloor:Gramadevatha of "Aranattukara". Ooralan: Moolathadam Nair Family. Laloor pooram has the privilege of the first pooram to hoist the pooram flag before noon of the "Kodiyettam" day. System followed is "Padahadhy" style. The next day o f "Kodiyettam" Laloor Bhagavathy, after daily rituals travels to Pookkattikkara -Karamukku temple. After the poojas there, Devi travels back to Laloor along with Karamukku Bhagavathy. It is believed that this courtesy call to fellow pooram participant was another extinct rituals where all ten participants followed once. Laloor Pooram: On the seventh day after Tantric Poojas. Laloor Bhagavati's "Ezhunnallippu" starts Pooram muhurtham at 6.30am Along with "Nadhaswram" and Panchavadhyam with five elephants, the Ezhunnallippu reaches at Naduvilal of Swaraj round. During the course of time the number of elephants increases to nine. The melam starts procession moves to Sreemoola Sthanam withPandymelam and ends at 10.30am the deity go inside temple to pay respects to Lord Vadakkumanathan and exit to Southern gopuram and returns to Laloor. Night Pooram starts at 6.30pm from the temple and the day time routine is repeated. Next day after "Kodikkal Pooram", "Kodikkuth" and "Uthram Pattu" the celebration ends. On the Trichur Pooram day at 6.30am Bhagavathy with all pomp and pageantry goes to Trichur Town accompanied by "Nadhaswaram". The villagers and devotees follow to participate in the pooram. Pakal Pooram commences at 9.30am and ends at 11am. After pakal Pooram Bhagavathy takes rest in Paramekkavu Temple. The Paramekkavu pooram will start only after the choorakkottukave Bhagavathy reached in the Paramekkavu. "Rathri Pooram" commences at 10pm and ends at 12 O clock. On both occasions Chenda artists perform "Pandimelam". Immediately after "Rathri Pooram" Bhagavathy returns to temple. On the next day with "Kodikkal Pooram" Pooram celebrations come to an end. The temple is at ayyanthole some 1.5 km from the dist. headquarters Civil lines. The temple is one among the 108 Durgalayas. Lord Vishnu was born as the child of Devaki as Sreekrishna and the Adi parasakthy as the daughter of Yasodha. As directed by an oracle Vasudeva exchanged the new borns. As usual Kamsa tried to kill the new born baby by striking it against a rock. Mahamaya escaped from the hands of Kamsa by pushing on his shoulders. this concept is "Karthiyani" as per "mahabagavatha" Ayya means "Kamsa" and "thole" means shoulder and the combination is the Ayyanthole. The beautiful mural paintings decorate the walls of sanctum sanctorum. Naveekarana kalasa was performed and the towering gopuram is about to be completed. On pooram day Pooram, Devi sets out to Vadakkumnathan on the elephant backs at 6 a.m. accompanied by Thavil, Vadya, thala and Mela. All the people of the area including the friends and relatives assembled in the temple sufficiently early to have a glimpse of the spectacular possession and show of divine splendor. It is the custom of the people to accompany the Devi to some distance and also decorate the street with flowers and place lighted traditional lamp (Nilavilakku/Nirapara) on either side of the road along which Devi may pass. There will be three elephants and Nadapandi until the possession reaches Kottappuram Railway bridge. From railway bridge two more elephants are added and Panchavadyambegins when it reaches Naduvilal point, the number of elephants rises to Thirteen and Melam starts pooram moves to Sree Moola Sthanam and concludes. Devi enters into the Vadakkumnathan temple after worshipping Lord Siva, comes out through the southern gateway. The whole process is repeated in the night as well. The next day after the Uthram Vilakku in the night, with the de-hoisting of the temple flag, the pooram celebrations comes to an end. Naithalkavu The myth behind the arrival of the Naithalakkavu Amma to Kuttur is that she came along with "Kunddil Nambiddi" from Arimbur, a place west to Thrissur. Kunddil Nambiddi during his pilgrimage came to PallipuramSiva temple and placed his umbrella down near the temple, after which it became impossible for him to lift it. Knowing that the Amma liked to stay on the same place near Siva, she was installed on a plate having NAI(ghee) with sesame lamp (Thila in Sanskrit). Thus the name Nai-thila- kavu became popular. She is the regional deity of Kuttur, Pamboor & Attoor. There is no roof on the sanctum sanctorum of the Naithalakkavu Amma. The sanctum sanctorum of Shiva in this temple is one of the largest rounded sanctorum in Kerala. Besides Siva and Naithalakkavu Amma,Sri Durga, Shastra, Ganapathi, Anthimahakalan, Rashasu & Dampathu Rashasu is been present as Upadevas. A Rashasu namedKelumman is installed under Alstonius (Pala) tree outside the walls of the temple. The Naithalakkavu Amma is faced towards west, while Siva is faced to east direction. It is an important temple among Vadakkunthan's Rishabhagiri temples. On pooram day Devi starts from the temple by 8.30 am with Nadaswaram and nadapandy. At naduvilal Ganapathy temple there is an "erakky pooja". The no: elephants will increase to 11 and with pandi melam Devi enters to maidan at 11am. The melam will end at sreemoolasthanam at one noon and Devi moves to vadakkumnathan and leaves through southern gopuram. Devi takes rest at karthyiani temple near Naduvil madom, Pazhayanadakkavu. Night pooram will start from the Karthyiani temple at 11pm and through Naduvilal enters to maidan with pandi melam and stops atsreemoolasthanam by midnight one o clock. Devi returns to the neithal kavu temple and reaches at 3am In the evening, after arattu, kodikkal pooram the celebration comes to an end. After announcing the pooram on the previous day of thrissur pooram bhagavathy pays a visit to Thiruvambadi and moothedathu man and returns to the abode. Apart from the principal deities of the Paramekkavu and Thiruvambadi, eight other temple deities participate in the Thrissur Pooram: six Goddesses and two from temples dedicated o Lord Sastha. They are the Kanimangalam and Panakkampilli Sasthas, and the Bhagavathis from Pookkatikara, Choorakotukavu, Laloor, Naithilakavu, Ayyanthole and Chembukavu. The Kanimangalam Sastha is the first God - who is the incarnation of "Brahspathi" (Deva Guru) - which is the premier pooram entering Sree Vadakkumnathan. It is interesting to note that only Sastha & Devi are participating in the pooram, may be because of Dravidian influence prevailed that time. There is four nos of siva temples, four nos of durga temples and four nos of large ponds are situated at nearly equidistant from the Sree vadakunnatha temple, the silent spectator of the pooram. Siva temple are "Erattachira - South, Chirakkal - west Asokeswaram - North & Midhunapilly - east. Durga temples are Pookkattikkara - karamukukku, Chiyyaram - South, Laloor south west, Ayyanthole, North west Chembookavu - Northeast. Pooram originally denotes the nakshatram or star of the Malayalam month in which the festival is celebrated. It was on pooram days that temples in Central Kerala held their annual festivals honouring their deity with processions of caparisoned elephants and percussion ensembles. Pooram festival season begins in November and extends up to May. Although there are hundreds of pooram festivals in this season, the most important one is the Thrissur pooram which is celebrated on the Pooram Day of Medom Month of the Malayalam Era (mid-April to mid-May). Another Pooram of similar significance is the Arattupuzha Pooram which falls on the Pooram Day in the previous Malayalam Month of Meenam. Pooram festivals are also conducted on other days of the month all over Kerala, the unifying factor being the small processional image of the deity, called the thidambu, which is placed at the base of a golden shield-like kolam, which is mounted atop the tallest male tusker and flanked by other elephants. Though the minimum number of elephants will be three, in the bigger festivals it can be as many as twenty-one or more. Fireworks are an essential part of almost all events in Kerala .But in Thrissur Pooram, the fire works are distinct in character, performance, excellence and magnitude. Both Thiruvambady and Paramekkavu temples compete with each other to provide the crowd with the best and the most unexpected. People come from faraway places to watch this amazing display of pyrotechnics. There are four major firework displays in Thrissur Pooram. The 'sample fireworks' on the day before the Pooram, the colorful sparklers that light up the sky (amittu) by both sides on the Pooram evening after the Southward Descent, the most impressive event that mark the peak of Pooram celebrations in the early morning hours, and the final fireworks the following noon after the Goddesses bid farewell to each other that mark the end of Pooram. The chemistry : The technique is a mixture of sound, light and strength, the proportion may vary according to the type - say amittu( less sound more colour full), dynamite (High pitch sound only) Earlier potassium chlorate was used to increase the loudness and was replaced by potassium nitrate since earlier is more accident prone. The colour full display of amittu was started in Thrissur pooram. Thanks to Dr.T.C. Krishnamenon for his able guidance. This is only a guide line and proportion is the skill of the technocrat and Aluminum powder, magnesium etc are added to give some gimmicks. According to sources, an active member of Thrissur Pooram committee witnessed a Chinese firework display during his visit to the Park Fare Exhibition at Madras about 80 years ago. Inspired by the spectacle, he brought some items of Chinese fireworks to Thrissur like poothiri, lathiri, moolipeevu, vaanam etc. It obviously fired popular imagination and in no time, the art and craft of fireworks was taken up by enterprising indigenous families, who developed it into the pulsating event that it is now. Every year new and never-seen-before items are added to the fireworks, with both the temples devoting a large share of resources for it. The earliest masters of fireworks display, like Kuriya, Ponnuveetil Gopalan Nair, Vellattu Narayana Panicker, Chelapadan Anthony, Vadakkethala Kochapu etc were not formally or technically trained in the art. They learned it through experience and experimentation and virtually developed it into a major industry. All the fireworks-managers of today are the followers of these pioneers. For a long time the responsibility of the Paramekkavu fireworks was vested with Karayarakattil Jose, who has now retired from the scene. It was only in the early 1970's that a fixed schedule for fireworks display was introduced. Until then whichever party - Paramekkavu or Thiruvambady - that reaches the pandal first would begin their fireworks display. As this led to a lot of misunderstandings and also untoward incidents, a rotation system was introduced. According to this, each temple would take turns to light their fireworks first. From then on, both the parties have followed this system. The Trichur Pooram Exhibition, yet another major attraction of the Pooram is The Trichur Pooram Exhibition one of the biggest Trade Fairs in south India. It is an all-India exhibition that generates significant revenue for the Pooram organizers. The Exhibition which starts a month before pooram was conducted in the vicinity of Vadakumnathan. Venues and organizers changed during the course of time. Thrissur Municipality, entrusted Y.M.A to run it in the year 1933 and afterwards to the stadium committee. In the 1964 the two groups of temples requested the municipality to allow them to run the exhibition to meet the expenses of Thrissur Pooram. In this year these 9 temples joined together (the 10th pooram Panemukkuppily stopped long before this) and refused to stage their respective poorams in support of this demand. That year all temples staged the pooram with one elephant just only to meet basic temple rituals. This hurt the feelings of devotees, traders, artists, artisans and people of all walks of life, Tourist Development Corporation, Thrissur Municipality, respective Panchayaths and Government in general. They started negotiations with these 9 temples through their office bearers and ascertained from them the hardships experienced for conducting the Pooram. Ultimately Thrissur Municipality admitted the demand of the 9 temples was just and genuine and the right to conduct the pooram exhibition was handed over to "Pooram Nadathippukar" (the people who are authorized to conduct poorams). This exhibition is the showcases of pavilions and stalls of major commercial, industrial and entertainment houses in the country. The exhibition profit could be used exclusively for conducting Thrissur Pooram Festival but unfortunately this was diverted for other purpose and only a part of it is used for Thrissur Pooram Festival. This is against the principle of "philanthropic Purpose". At the same time the Constituent Poorams of 8 temples find it very difficult to celebrate their festival with pomp and decorum as the office bearers of these temples feel hardship and financial difficulty. Under these circumstances the 8 temples put-up their demand for participations in the exhibition committee and equal share from the funds generated from it. As the demand turned to civil case and interim judgment, the respective Exhibition committees started to give small contribution to 8 Constituent Poorams annually. The grant show of temples in the vicinity of the vast Vadakkumnathan temple was started in the present form by the great visionary the Sakthan Thampuran, the ruler of the Cochin State. Now the pooram is celebrated with processions from various temples consisting of caparisoned elephants decorated deities embedded in golden Kolams held with colorful specially prepared large umbrellas and Alavattam made out of peacock feathers and Venchmarams. Each of these decorative items are held and exhibited according to the beating of drums by trained men sat over the elephant. The accompaniment to the elephants stationed in front of elephants consists of drummers, officials of the temple and residents of that particular area mostly the devotees of that temple. as Thrissur pooram has become one of the greatest attractions of the people not only from Kerala but also from other countries of the world, the responsibility of the local administration and the organizers have become much more than the usual rituals. Now they are trying to improve the show by adding improved themes in the show. This will also help to minimize the monotony of locals who throng to the venue every year. The madomthil varavu (panchavadhyam) of Thiruvambady and Elinjithara melam ( pandi melam) of Paramekkavu should continue like this. The pakal pooram (day pooram) at Sreemoolasthanam "pandi" by Thiruvambady. either it may be changed to "Panjari" or the "Panjavadhyam" may continue till the end. Night pooram both Paramekkavu and Thiruvambady is on Panjavadhyam. Night it is better. Again second day. Paramekkavu may try "Panjari" and thiruvambadi as usual "Pandi"
Since Thrissur pooram is commonly known as drum oriented festival, the improvements should be limited to the present structure so that it should cater with the taste of visiting people consisting of large number of foreigners and non-Malaya lees. The present forms of Melam and panchavadyam are the live wires of the show and this should be improved with well known artists accompaniments. The restrictions and the time limit in the Thekkinkadu Maidan also hamper them considerably. Taking into all these aspects including the thin attendance in the main thoroughfare like the Kuruppam Road and M.G. Road from where all these poorams originate should be the focal point for improvisation. These will attract more tourists to these pooram even before entering the main venue, the maiden. During the procession including the start of it, the following forms of drums which is suitable to amalgamate with our drums and processions can be included in intervals as this temple rituals from other parts of our country which has now started coming out of the walls of temple are attracting large number of people when they are shown along with various programmers. Some Interesting Indian Art forms (general information). This is Manipuri drum dance where the drummers and musicians will dance along with the music and the sound in different formation vary vigorously and it is a treat to watch. This art form the singers have two instruments, one is called a string instrument and the other one is a small thabala and they will be singing, dancing and drumming and moving from one place to another in different formations. This is a very melodies traditional, religious and ancient art form they sing Bhajans of various Gods. There are physical movements similar to marshal arts (rigorous) with very large size drums and Musical instruments. In this form the instrument is called lasam and with help of this they sing and dance in different combinations. In this dance form men wearing colorful dresses with turban on their head will drum and dance in different formations.